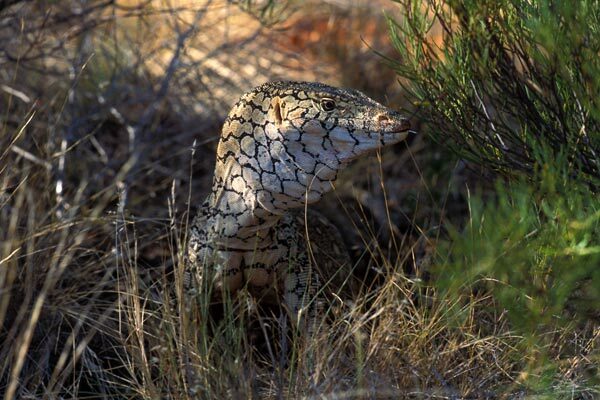 The Perentie is Australia's largest lizard. It was very high on the list of reptiles I most hoped to find on this trip to Australia, perhaps second only to the Thorny Devil (Moloch horridus), which alas I did not see in the wild this time. 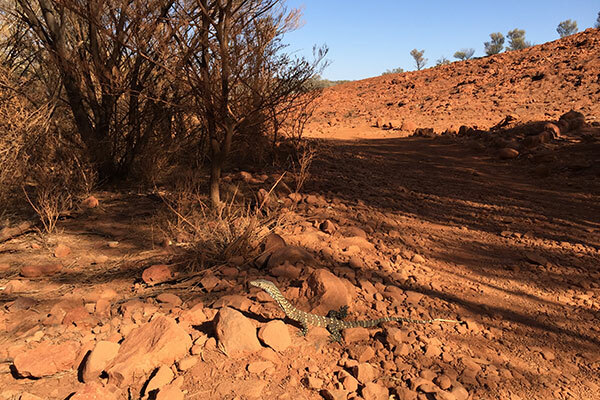 We first saw this tremendous lizard as a large dark shape moving across the (essentially deserted) Lasseter Highway that leads from Uluru back towards Alice Springs. My initial thought when I spotted it in the distance was that it was a medium to large-sized dog. As we got closer its lizardy shape and movements became more obvious, and I became more excited. 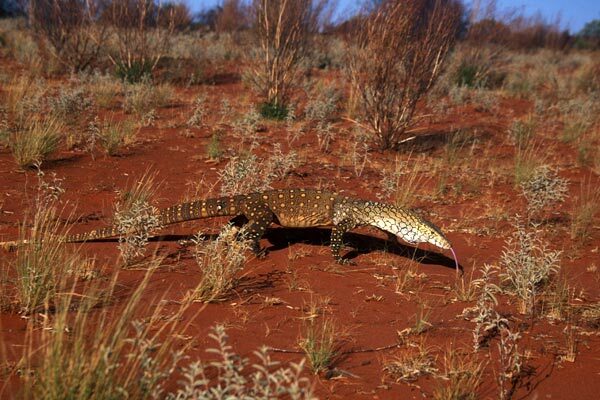 I had heard that Perenties were extremely wary of people, and likely to race off after detecting a human's presence, but that was not my experience at all. This lizard never sped up faster than a slow amble, though we followed it around for ten to fifteen minutes taking photographs. Every few minutes it would stop strolling and squat down with its head lifted high, scanning its surroundings. Dr. Nancy Heger of the University of Texas at Austin told me by email that she saw this display quite often in her field studies of this species. She thinks it is probably looking for trouble, including rival perenties, predators, or potential dangers such as mother emus defending their chicks. 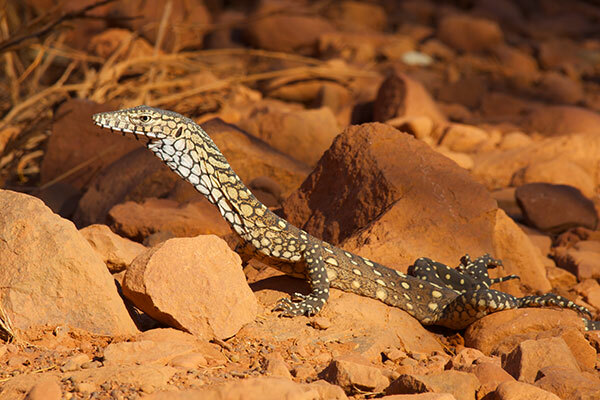 Dr. Heger also commented that the stance of the strutting perentie in the second photo is typical for a lizard trying to appear big and frightening to thwart any further encounter with a perceived threat (me). My wife and I were climbing back up the trail that leads from the Murchison River up to Ross Graham Lookout when we hear something fairly large (rabbit? wallaby? large agamid lizard?) scrambling through the bushes near our feet. 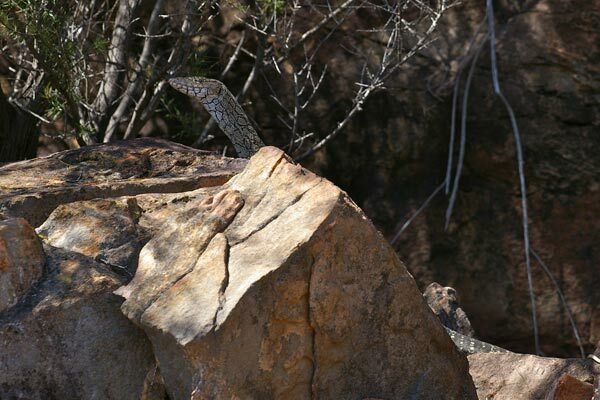 I looked in the direction the sound was going and spotted this Perentie eyeing us cautiously from its semi-concealed perch in a pile of jumbled boulders. I still don't know what animal made the first sound we heard, but I lost all interest once I saw this magnificent lizard. 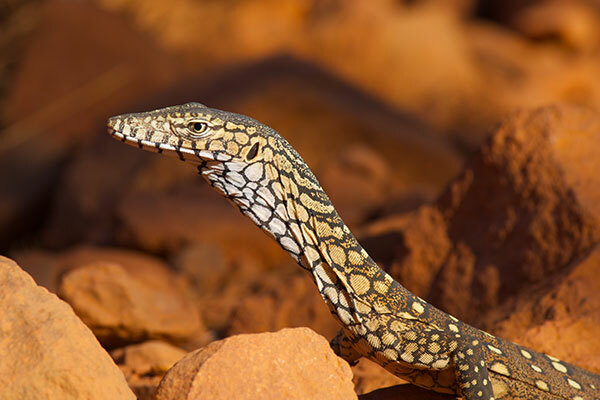 Later I discovered that the Perentie had not been previously recorded from this area, so this sighting extends its known range. I was on my way back after a beautiful but herpetologically unproductive morning hike, when I turned a corner and saw this gorgeous young lizard with its tail only a few inches off of the trail. I very slowly pulled my iPhone out of my pocket to get a photo in case it was about to race off, but it was unperturbed, so I then switched to my 100mm macro lens on a tripod. So cooperative! So beautiful!